Design by Anne De Wolf. Photos by Photo Art Portraits. 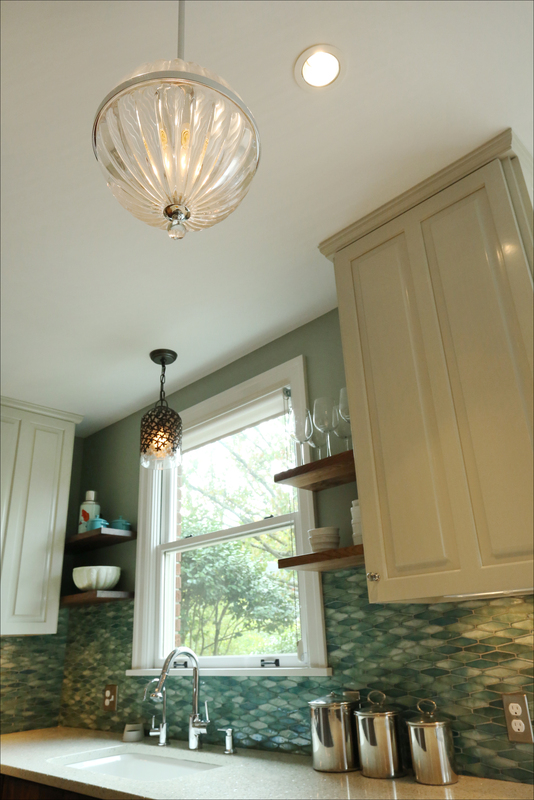 For Paris and Stan, their kitchen renovation was all about adding joy and a touch of elegant whimsy to a hard-working space that needed to serve as kitchen, mudroom, pantry, office and family gathering hub. Dated fixtures and finishes and a cramped footprint made this kitchen an unwelcoming and inconvenient space in the heart of their home. 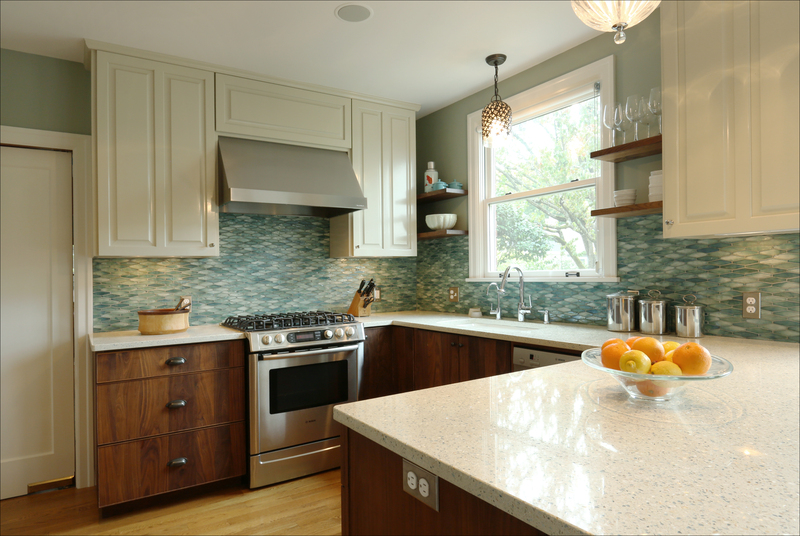 Arciform: What were your goals with this kitchen remodel? We wanted something special, not run-of-the-mill, that would reflect our family’s personality. We also wanted each family member to have their own cubby to store their gear and we wanted the space to be a welcoming hangout for the family to share “family time” together. Pendant lights selected after much searching add a touch of whimsy to the space, while ice stone counters with embedded flecks of glass and mother of pearl create a sense of luxury and surprise. 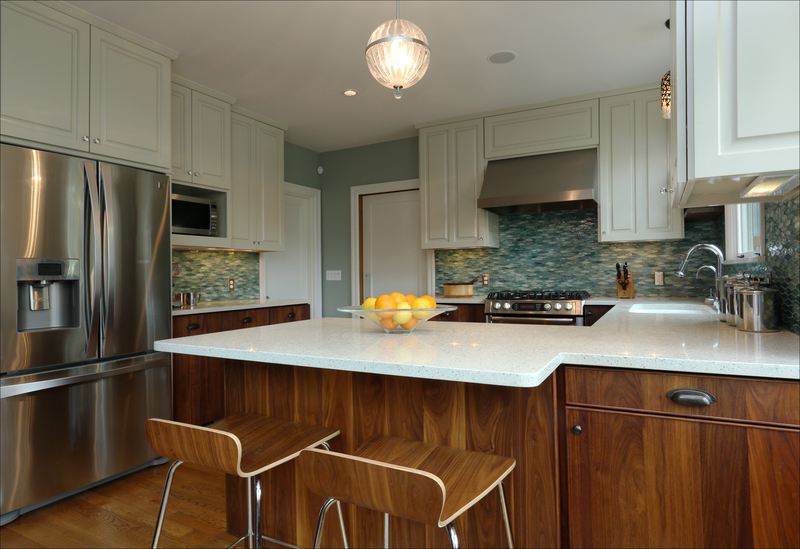 Turquoise diamond-shaped glass tile add color and texture. Arciform: What were some of the challenges the project faced and how did you address them? The space was small and dark and right in the central pathway of the home. 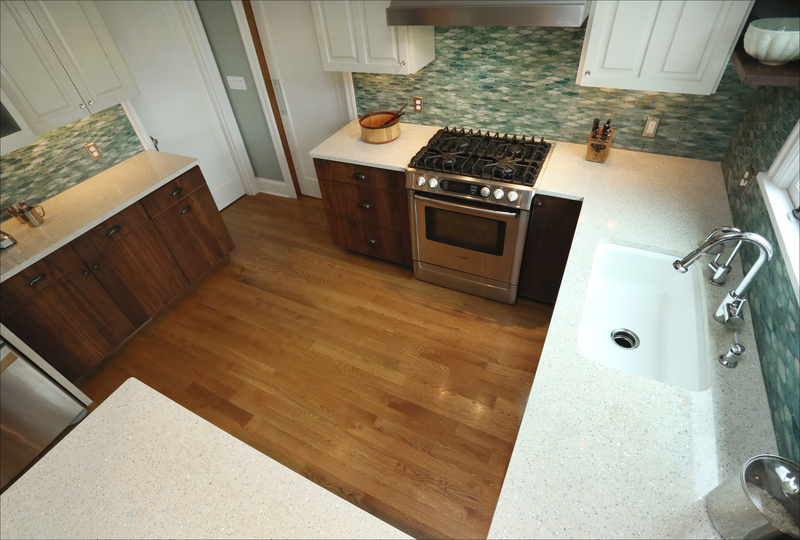 We chose reflective surfaces like stainless steel and light gloss upper cabinet finishes to capture as much light as possible. 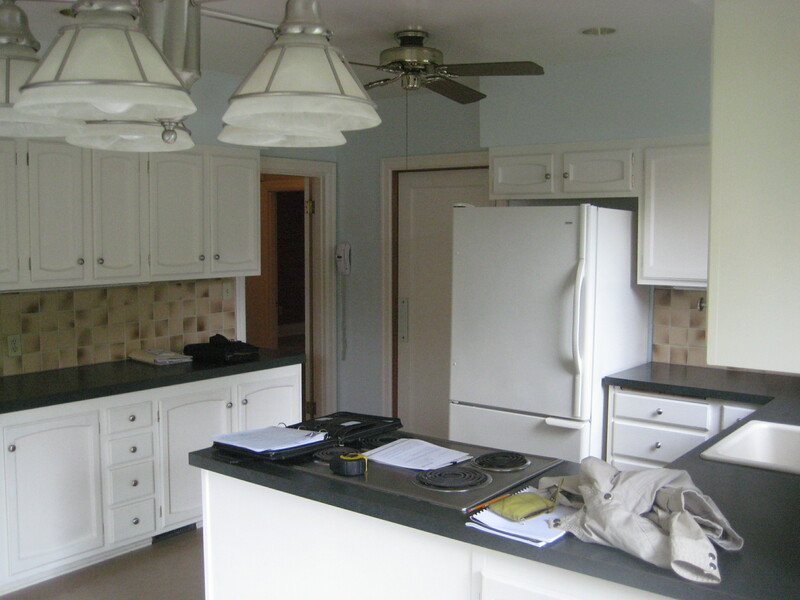 Full height cabinets make the most of every available inch of storage. The lower cabinets also have additional built-in storage solutions, including access to the storage space from both sides of the breakfast bar. Arciform: What’s your favorite part of the completed design? We love everything. 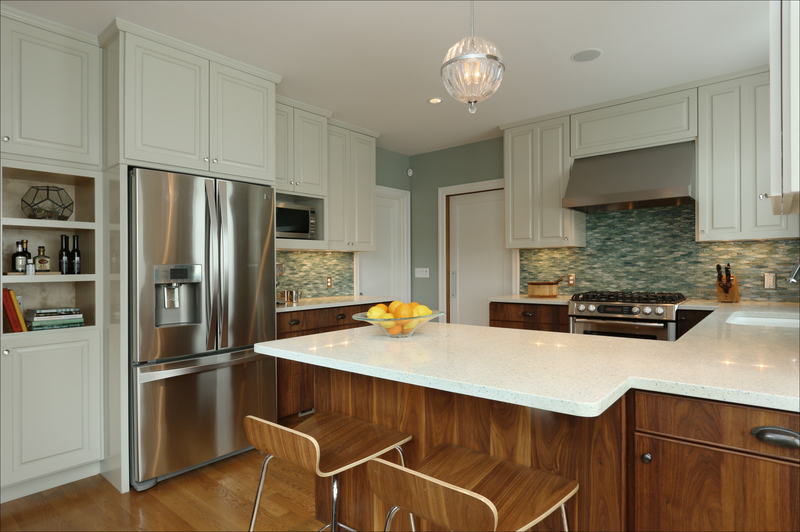 The textures make us happy, from the warm grain of the walnut lower cabinets to the diamond shaped glass tile backsplash and the glass knobs on the cabinet doors. 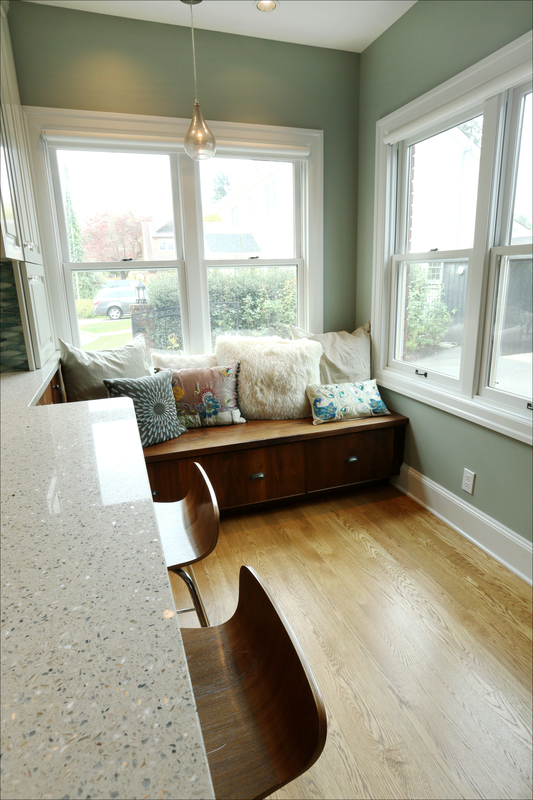 Family time is important to us, so we love the nook and the large breakfast counter. Our daughter can sit and clean her aquarium while we’re prepping dinner or finishing up work from the office. Arciform: Tell us about the experience of working with Arciform. Anne kept saying it would look great. We were skeptical at first but we love it now. We’re really happy we went this direction. ← Check out the Bat Houses!